Pending: Only orders for physical products appear here. Completed: All digital product orders will instantly appear as completed. Physical product orders will appear as completed after you’ve marked them as complete. Cancelled: Physical product orders will appear as cancelled if you mark them as such. Click the check box next to an order in the list to select it. Mark Completed: Pending orders only. Set the selected orders as complete to move them to the Completed Orders status category. A confirmation box appears where you can choose to send shipping confirmation e-mails after confirming the orders as complete. Mark Pending: Completed orders only: Set the selected orders as pending to move them to the Pending Orders status category. Print: Print invoices for the orders. Clear Selection: Deselects any orders selected in the list. Select All: Selects all the orders in the Pending status list. Click an order (but don’t click the check box). Order: View the entire order’s information, including billing and shipping information, items and quantities ordered, subtotal, tax, shipping costs, and grand total. History: View a list of all the actions taken on an order. These actions might include when the order was shipped, marked completed, or cancelled. Notes: Add any private notes you need to record with the order. The customer won’t see these notes. Email Notifications: Resend the order confirmation or shipping notice, as well as send a private message to the customer. When a customer places an order on your site, he or she will receive an order confirmation e-mail. When you mark an order as complete, a shipping notice is automatically sent to the customer. Print: Print an invoice for the order. Issue Refund: Send the customer a partial refund. Cancel Order: Issue a full refund to the customer and move the order to the Cancelled status area. Mark Completed: Pending orders only. Set the selected orders as complete to move them to the Completed Orders Status category. Mark Pending: Completed orders only. Set the selected orders as pending to move them to the Pending Orders status category. When a customer orders a physical product, it is added to the Pending area of Commerce→Orders. 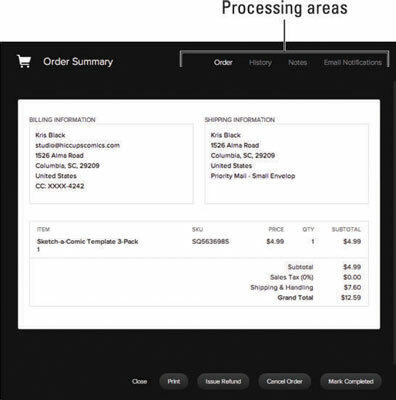 Digital orders are automatically added to the Completed area because your website will automatically send the customer a link to the digital file. 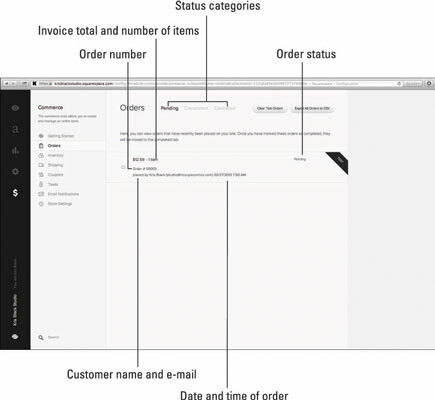 At the top of the screen is a button to export all your orders from all three status categories. Export your orders to a spreadsheet, and you can open the spreadsheet in Microsoft Excel, Apple Numbers, or Google Docs and integrate the spreadsheet in a business application for accounting or other financial reasons.